I’m not old. Let’s be very clear about that. But the odds are incredibly high that one day I will be old. So that’s why I’m planning ahead. Practically, I’m planning ahead by investing in some long-term care insurance. It’s not the most fun purchase I’ve ever made, but it’s important preparation for my physical and mental wellbeing in years to come. And what about your spiritual preparation for old age? God has asked me more than once recently. Good question. How exactly do I prepare spiritually for life in my 70s and 80s, if God gives me that many years? I would like to age into a grateful, faithful, peaceful, joyful, still-learning, still-giving old woman. But I know that won’t happen automatically. So I’ve been responding to God’s question with a question of my own: Father, how can I mature into that gracious old woman I’d like to become? And He’s answered in various ways. He’s introduced me to men and women who are living in joyful faith in spite of the losses and trials of aging. He’s helped me discover saints who, well into their 80s, still exude humble wisdom. And He’s opened my eyes to Bible stories of people who aged well . . . and ones who didn’t. For example, 2 Chronicles records the history of the kings of Judah. It amazes me to see how many kings started well—I mean, really well—yet ended in spiritual failure. Their stories give me fodder for some serious soul-forming prayers. Here are some of those kings, the ways they lost spiritual traction, and the prayers-for-aging I’m praying as a result. Asa was an awesome king early on. He rid his kingdom of idols. He even removed his own grandmother from her position as queen mother because of her pagan idols. Asa depended on God for success in battle—and God answered. But Asa blew it during a military threat late in life. Instead of praying, he tried to buy military protection. When a godly man attempted to correct him, he went into a rage and punished him. And it was just downhill from there. Lord, I know that I can’t buy security. You alone are my shield and fortress. Forgive me for times when fear moves me to depend on anything besides You to protect me. Help me to trust You—completely—all the days of my life. Jehoshaphat started out as a great king, too. He obeyed God. He led the nation in pure worship. And when enemies threatened, he also went to God. He’s famous for the prayer, “We don’t know what to do, but our eyes are on You” (20:12). But Jehoshaphat had a bad habit of investing in relationships that compromised his walk with God. Ultimately the Lord destroyed his work because he continued to “help wicked people and love those who hate the Lord” (19:2). God, whenever I try to please people, I always get into trouble. Grow in me an ever-deeper desire to live for Your “Well done,” so that I am not tempted to give my loyalties to people who will lead me away from You. Then there’s Joash. As long as his godly counselor lived, Joash was a wonderful king. He carefully did what was right in the Lord’s sight, including overseeing a huge temple renovation project. But after his counselor died, Joash went to wicked men for guidance—and they led him to sin. Apparently Joash didn’t have a moral compass. Lacking his own inner resources, Joash was only as good as the counsel others gave him. Jesus, strengthen me in my inner person. Give me spiritual discernment so that I can know right from wrong and wisdom from foolishness. When I need outside counsel, please give me godly counselors. At first, King Uzziah feared the Lord and dedicated his life to serving Him. Because of this, the Lord gave him success for many years. But Uzziah’s success eventually went to his head. He didn’t think God’s laws applied to him anymore. The priests tried to correct him, but he only raged at them. So God struck him with leprosy. Father, my blessings come from Your hand—all I have and am is from You. Give me a humble and teachable heart. Help me to take correction gracefully. Keep me soft, even into my old age. For decades, Hezekiah was a very cool king. He reinstated the Passover after many long years of neglect and prompted a revival among some of the apostate tribes of Israel. He interceded for backsliders, and God responded by healing them. But late in life, he no longer responded to the Lord’s kindness. He became proud and ungrateful. Early on he had been faithful to God and gracious to his people, but Hezekiah finished out his life as a self-centered old man. God, help me never to take Your kindness for granted. Give me a thankful heart that overflows with gratitude. And help me always to be concerned about others. Even when my own time on earth is almost over, help me to care about those who come after me, doing whatever I can to help them live in Your blessing. I don’t think of myself as a controlling person. It’s just that I sometimes think God should handle things a little differently than He does. Yeah, yeah, I know. I’m not fooling anyone. So, I admit it. I’m not very open-handed with some of my prayers. But don’t I have good reason to try to control things once in a while? I mean, God sometimes doesn’t seem to follow His own rules! Before you get upset with me for saying such things, consider these examples of things that I pray about, and you probably do, too. I pray for marriages. God says He hates divorce. So if I pray for friends’ marriages to heal, don’t I have a right to be upset when they break up? I pray for churches. When I pray earnestly for churches not to split, then shouldn’t God intervene? How can it bring Him glory to if people scatter everywhere, hurt, angry, and bewildered? Didn’t Jesus pray for us to be one as He and the Father are one? I pray for young people. When young people I care about choose lifestyles that run counter to God’s ways, aren’t I right to ask God to turn them around and set them back on the path? After all, the parents of these young people dedicated them to Him as babies. They raised them in His ways. So shouldn’t God do something to ensure they stay on His path? I pray for relational healing. When I pray for relationships to reconcile, why would God allow the parties to become more embittered and distant? He’s the one who pronounces blessings on peacemakers and urges us to forgive one another from the heart. So why do those prayers sometimes seem to go unanswered? I don’t want to sound super-spiritual because I’m not! But I hope you can see that that the prayers I am addressing here are not self-focused please-help-me-find-a-parking-space prayers. They are kingdom-oriented, God-honoring, Scripture-based prayers for things God says are important to Him. My inner control freak kicks in when I pray about matters that I know are His will—and He doesn’t come through the way I anticipate He should. I was fretting about one of these straight-from-Scripture prayers recently when God reminded me of some familiar Bible characters. Jacob, the patriarch, wandered for years before he finally claimed his father’s God as his own. Hagar’s family situation didn’t work out the way she prayed—but God saw her and blessed her and her son. Moses, Israel’s deliverer, murdered a man and hid out for 40 years before stepping into the role God created for him. Hosea lavished his love on a woman who cheated him time and time again—but in the process he discovered God’s love, deeper and more real than he could have ever imagined. Jonah became fish food before he finally turned around and obeyed God’s call. The church at Corinth, even with the super Apostle Paul interceding for it, had all manner of division before finally repenting. God helped me to see that His path, though always good and right, isn’t necessarily straight and quick. He reminded me that I haven’t read the final chapter yet. Somehow, I figure that if I pray hard enough for kingdom things, then there should be no detours, no washed-out bridges, and no GPS malfunctions. But God’s Word doesn’t say that. God’s people have often traveled on rough and winding paths before reaching the destinations He has planned for them. Whether the delays are a result of their own choices, or because of road blocks He Himself has put up, either way, God hasn’t lost them. His plans will not be thwarted. And He doesn’t need my help, thank you very much. So, when things seem to go 180-degrees opposite of the direction I’m praying, God is helping me to release control. He’s gently prying open my hands so that I can allow Him to work—even though He is going about it differently and taking longer than I expected. * I make my morning coffee with beans from Veracruz, Mexico, and pray for Bible studies across Latin America. * As I get dressed, I pull on my favorite giraffe socks (doesn’t everyone have favorite giraffe socks? ), and pray for a former missionary to Africa. * During my quiet time, I pray for my son, and also for a friend’s son whom I’ve never met. * Before breakfast, stomach growling, I pray for the Compassion children I sponsor who live in poverty. * On the way to work, I drive past a Hummer. Before it disappears in my rearview mirror, I lift up a prayer for a young man in Cambodia. * At dinner that night, while eating leftover curry, I pray for at-risk kids in an orphanage in Hyderabad. Pretty random praying, right? Yeah, it seems like it. But that’s because I’m not a very good list pray-er. I make prayer lists with every good intention, and then before long, lose them, forget about them, or otherwise neglect them. So God, knowing what I’m made of (see Psalm 103:14) has given me a way to pray for the important people and prayer needs I want to remember. The method isn’t systematic, but it is consistent. Each of the prayers I pray on the “composite day” I just wrote about are based on cues. The cues remind me of the people or needs I want to pray about. For example, the Hummer prayer is because the exchange student we hosted a few years ago was fascinated with Hummers and made remarks about them whenever we’d pass one. The giraffe socks? A gift from my friend who lived in Africa for 18 years. My friend’s son? Whenever I pray for my son, I remember to pray for my friend’s son, too. And the orphanage? I help to sponsor a Bible club in India, so I pray for the children there when I eat Indian food. You get the idea. If you are prayer-list challenge like I am, perhaps you could ask God to give you cues that will prompt you to pray for the people and needs that matter most to you. Anything can serve as a cue—photos on your refrigerator, activities you engage in, Facebook statuses from friends, items in a grocery store, headlines in the news, the label that says where your clothing was made, gifts you received from friends. You get the idea. The longer I go, the more prayer cues I accumulate. Which means that, without much effort at all, I find myself moving closer and closer to the goal of praying without ceasing. And I like that. Because I like being in steady communication with God throughout my day. I’m excited about my brand-new Bible study published by Prayer Shop Publishing last week. It’s the second in my Breakthrough Prayer Studies for Small Groups series. Here’s a sample so you can check out what it’s like. Philippians 4:6-7 is a passage familiar to many Christians, especially believers who care a lot about prayer: “Do not be anxious about anything, but in every situation, by prayer and petition, with thanksgiving, present your requests to God. And the peace of God, which transcends all understanding, will guard your hearts and your minds in Christ Jesus.” So when the Holy Spirit brought that passage to mind recently, I thought He was just reminding me not to worry so much and to pray more about the situations that were causing me anxiety. However, a phrase stuck out to me as I pondered those familiar words: with thanksgiving. Ordinarily, I’ve usually breezed right over that part of the instruction. If you’d ask me God’s method for having peace that passes understanding I probably would have said, “Don’t worry, but pray about everything.” And I would have been half right. Yes, God definitely wants me to give Him my worries and heartaches, my frustrations and fears—but He wants me to mingle those with thanksgiving. So I tried it. I thought about all my piles at work and my deadlines. I prayed and asked God for wisdom and help to get it done—well and on time. And then I took it the next step and thanked Him for the excellent team I work with who make the work load lighter and a whole lot more fun. Hmmm. I feel more peaceful already. I thought about a big decision I had to make that felt really hard to me. I used to make big decisions with my husband and even though he’d been gone five years already, I still missed him. So I prayed and asked God for guidance to make the decision. To lead me into His paths. And then I thanked Him for all the ways He had faithfully guided me since my husband’s death. He really has been a Husband to me. He hasn’t failed me yet—I don’t think He will this time, either. My heart was able to rest. The Holy Spirit’s gentle invitation to ponder more deeply a familiar passage of Scripture enabled me to pray prayers that were more “high road” than I would have ordinarily. And the result for me was peace. When I sense impending disaster, my praying can sometimes sound more like panicking-aloud-to-God than actual prayer. I’m still talking to God, and that’s far better than avoiding Him or trying to find my own solution. However, certain scriptures inspire me to pray with more trust, confidence and hope. Read the following passages. After each one, write down what the crisis was and how the pray-er(s) talked to God about it. What themes do you notice in these prayers? How does this compare with how you might ordinarily pray in these situations? How do these themes inspire you to pray more “high-road” prayers? Use one of them to pray about something on your heart right now. 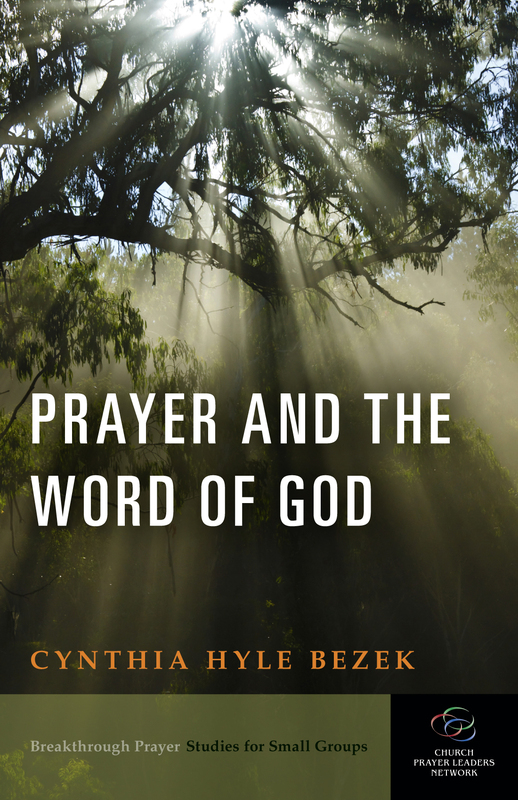 Cynthia Bezek’s New Prayer Bible Study Now Available! Prayer and the Word of God is a six-week Bible study that teaches you–through actually doing it–to read and pray God’s Word in ways that deepen your relationship and conversations with Him.